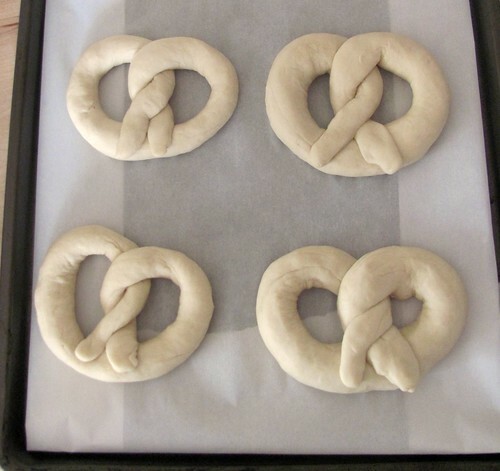 New Wave Domesticity: Soft pretzels in 5 easy steps! Soft pretzels in 5 easy steps! I love Portland and it is my home now, but the truth is - down in the core of me is an east coast girl. My heart still belongs to east coast cuisine. Philadelphians eat an average of 20 pounds of pretzels per year per person (the american average is 2 pounds per person) and you can find them for sale on just about every corner or convenience store in the Philadelphia metro area. Clearly pretzels were a staple of my adolescence and I miss them. No, I crave them. I decided this weekend, it was time to bring my childhood into my kitchen. I have to be honest, I was pretty intimidated by the process involved with making pretzels from scratch - the rising yeast and the boiling mostly - but I have to say that I am pleasantly surprised by how easy they were to make! If I can do it, I have faith that just about anyone can. Here is the soft pretzel process broken down in a very easy way. 5 simple steps, that is all! Step 1 - Make the dough. Combine warm water, salt, sugar, and yeast. Allow to sit for 5 minutes until the yeast starts to foam a bit. Add the flour and butter. Combine and knead for about 3-5 minutes. If you have a kitchenaid mixer, you can use your dough hook attachment and mix on medium speed or you can do it by hand. Step 2 - Let it rise. Oil your bowl and cover with a kitchen towel. Leave the dough in a warm place for about an hour to rise. Step 3 - Roll it out. Cut the dough into 8 equal pieces. Roll each piece into a long rope and twist together into a pretzel shape. You don't have to actually make a traditional pretzel, you can shape them any way you'd like. I made half the dough into pretzels and the other half into buns. Place the pretzels on pans lined with parchment paper with a brush of oil. Step 4 - Boil. In a big pot, combine 10 cups of water with 2/3 cup baking soda and bring to a boil. Place each pretzel into the pot, one by one, and cook for 30 seconds. Remove from the water with a large flat spatula (if you try to use tongs, it will mess up your pretty shape) and place back on the parchment paper. This step and the baking soda is nessisary to change the PH levels in the pretzel and give them that shiney golden brown color we all love so much. Step 5 - Bake it. Mix 1 tablespoon of water with one egg yolk to create an eggwash. Brush each one with the wash and sprinkle with pretzel salt. * Bake at 450 degrees for 12-14 minutes until you get a nice golden brown color. Place on a cooling rack for at least 5 minutes. *I could not find pretzel salt at our grocery store so I used sea salt...which was fine, it gave it a nice salty taste, but I do wish I had the real thing. It makes a difference. If you plan ahead, you can pick some up on amazon for $1.59/lb. 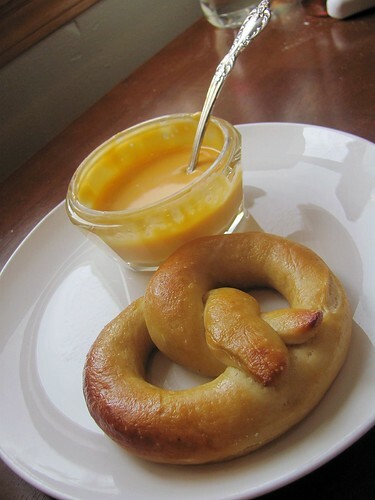 I should mention that when I told my coworkers of my planned pretzel adventures, several of them asked me if I would also be making a fancy mustard dipping sauce. NO. I certainly will not be making a fancy sauce. I am from Philly dudes, I got myself a jar of CHEESE WHIZ for the side! Seriously, if you want an authentic Philadelphia experience, you should try it. Don't knock it till you try it. Also, while I was pondering this whole plan, I was also reminded on one of my favorite sandwiches. 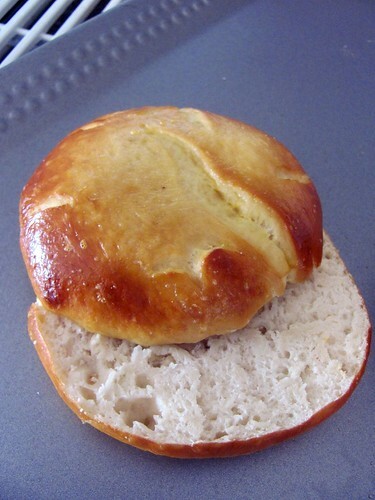 Mike's Drive In is a cute little burger joint in the Sellwood neighborhoood that features sandwiches on pretzel rolls and there is just something about those buns that just elevates the simple sandwich to a whole new place of amazing for me, so I decided to make a few pretzel rolls at home. Instead of rolling and shaping 3 of my dough pieces, I simply rolled them into a slightly flattened ball. I can't wait to make these into sandwiches for lunch this week!